Mistress katherine has been very busy indeed, submitting several projects to me at once. This tablet-woven mini coronet was inspired by Viscountess Mountjoye's spiffy example at Faire. 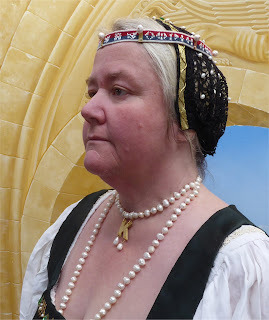 It uses one of the lovely tablet-woven garters Mistress Catherine d'Arc gave me which displays the curs' heads and tower from my arms as well as my livery colours or red, white and blue and my motto. It is embellished with the six pearls of a Court Baroness; the copper and brass mounts are actually letterpress printers' thins used to make leadtype tight when setting text, a reference to my Laurel speciality. Adding pearls, beads and some couched gold thread and trim has blinged up a plain commercially made hairnet. This necklace is based on the well-known portrait of Anne Boleyn from the UK's National Portrait Gallery, in which Anne has a capital B suspended from a pearl choker around her neck. I've had a craftwood initial K for a number of years, but delayed making this, hoping to be able to find a metal K rather then use a wooden one. Some slathering of gold paint has produced something that may pass in low light and I finally found a use for the large string of big freshwater pearls I've had for a while. The portrait of Anne Boleyn can be found here.